this event. They think he was probably killed by coyotes or maybe by a big dog. natural order of things, another species brought about his demise. Priory has all those odious Canada geese. monks as a gift from Father Bernard, back in 1998. You may want to see Father Augustine’s update on the Juniors at St Louis Abbey!!! Almost 300 monastics will gather in Rome, 17-25 September 2012, for the international Congress of Benedictine Abbots and Conventual Priors at the Primatial Abbey of St. Anselm on the Aventine Hill. Preceding the Congress, new monastic superiors will participate, 15-16 September 2012, in an orientation program. 25 representatives from Communio Internationalis Benedictinarum (CIB), an association of Benedictine sisters and nuns, will also attend the Congress. The Abbot Primate has invited ecumenical guests from the Orthodox and Reformed traditions. Benedictine monasteries, and Fr. Michael Casey OCSO offering a paper on autonomy in Benedictine life. In addition, a wide range of workshops will address current topics in monastic life; such as, Benedictine identity, stress and burnout, associate membership programs, management of monasteries, individualism in the monastery, relationship with Benedictine women, new forms of Benedictine presence in society, ecumenism, the paschal mystery in the sacred liturgy, new directions for inter-monastic dialogue, new structures for AIM, the changing role of the Athenæum S. Anselmo,the sexual abuse crisis, the role of the abbot, communio in the confederation,and the formation of “traditionalist” candidates. The assembled abbots and conventual priors will have the opportunity to visit in pilgrimage the monasteries of Subiaco, Montecassino, Norcia, and Camaldoli, which is celebrating its 1000th anniversary this year. 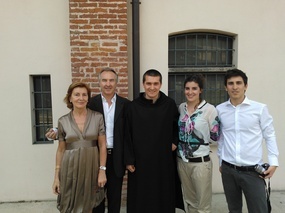 Nearly half of the 250 abbots and conventual priors will reside in the Collegio S. Anselmo, with the others, including CIB representatives and ecumenical guests, housed in area religious houses and hotels. An important item on the agenda is the election of the abbot primate of the Benedictine Confederation. According to the Lex Propria of the BenedictineConfederation, the abbot primate is elected for an eight-year term, and renewable thereafter every four years. There is no term limit to the office of abbot primate. The current abbot primate, Dr. Notker Wolf OSB, a monk of St. Ottilien Archabbey in Bavaria, is completing 12 years of service, having beenre-elected in 2008. Your prayers for the success of the Congress are greatly appreciated. News flash! A growing number of Benedictine monasteries are brewing beer in the USA and in Europe. Originating in Babylonia and Mesopotamia, around the area of Georgia, about the year of 6,000 BC, beer was brewed. Fast forward several years and you’ll find Benedictine monks perfecting the brewing beer. Rich in vitamin B, beer was seen as safer than drinking water and it had nutritional value, hence, liquid bread. The monastic communities in Italy, Germany, the Czech Republic, Ireland, Austria, Belgium and the Netherlands among others have been busy with the brew. 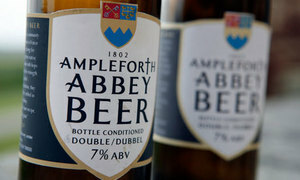 Recently, monasteries have been starting up companies like Abbey Beverage Company (of the Abbey of Christ in the Desert) to meet a demand boutique beers. One can also point to the monasteries of Ampleforth (UK), La Cascinazza (Italy), Norcia (Italy), and Spencer (MA) as new brewers. Trust in the Lord and do good, and you will dwell in the land and be secure. Find your delight in the Lord, and he will grant your heart’s desire. These days there are celebrations of profession of vows and recognition of 50 years of monastic profession. The vocation to the monastic life is the search for God (cf. Rule of St Benedict) by the serious living of the gospel and one’s baptism. It is a glorious vocation, one that entering the narrow gate is not easy but eloquent for its witness. Three friends are living their vocation with fresh eyes. Each called by the Lord to follow and to be see-ers of the Kingdom (cf. Ratzinger) in this manner is sacrificial oriented to life eternal (cf. Spe Salvi, 12). Benedictine Brother Pietro, a monk of the Monastery of Saint Peter and Paul (outside Milan, Italy) professed his first vows (temporary profession), Father Hilary of the Abbey of Saint Mary (Morristown, NJ) celebrated his 50th annviersary, and Benedictine Sister Marie Rita celebrated her 50th anniversary of profession of monastic vows. There are several others I could mention but let me satisfy this desire to recognize the sign of profession for service of the Kingdom and one’s salvation. Brother Pietro studied medicine and follows the lay ecclesial movement of Communion and Liberation. His monastery is a diocesan rite monastery following the Rule of SaInt Benedict and the teachings of the Servant of God Father Luigi Giussani. Pietro gave up a promising career in medicine to follow and seek the face of Christ more intimately in an Italian monastery. I can’t help but think of Pietro’s vocation as a witness poignant today in postmodern Italy where monasteries are virtually empty. His monastery receives postulants regularly and I am grateful for his YES. 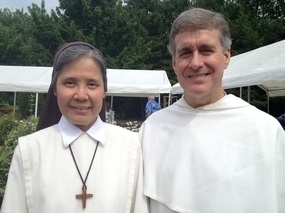 Father Hilary is a monk and a priest of Morristown, NJ’s Abbey of Saint Mary where he teaches in the Delbarton School and he works in the community as novice and formation director. In the American Cassinese Congregation of monks the 50 year julibilarian receives from the abbot the baculus (a craved stick; this one is made in Ireland) with the liturgical phrase exhorting the monk, “Use the baculus not so much as a support for bodily strength, but rather to obtain spiritual fortitude from our Savior, Jesus Christ, who has called us all to himself in the gospel, saying, Come to me all you who labor and are burdened, and I will refresh you, for my yoke is easy, my burden light.” Hilary’s quiet demeanor is a stable form of living the manner set out by the Lord and Benedict. 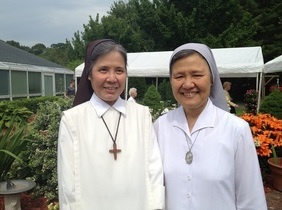 Sister Rita is the Prioress of the Monastery of the Glorious Cross, Branford, CT. Her’s is a vocation to lead a group of women who daily surrender to the Lord their health and mobility uniting themselves more and more eucharistically. At Sister’s Jubilee Mass more than 75 friends attended with spiritual assistance of Father Peter John Cameron, OP celebrating the Mass and preaching, with Abbot Caedmon Holmes, OSB (of Portsmouth Abbey), Father Prior Vincent DeLucia, OP (St Mary’s Priory, New Haven), Father Jacob Restrick, OP (Hawthorne, NY) Father David Borino (Archdiocese of Hartford), Father Robert Usenza (Diocese of Bridgeport and Father Paul Halovich and Deacon Fusco (also of Hartford). Sister Rita’s sister Canossian Daughter of Charity Sister Margaret flew in from China where she is a missionary to be present. The Canossian sisters have the great Saint Josephine Bakhita as one of them. As you may know, monks and nuns profess the monastic vows of conversion of manners, stability and obedience according to the Rule of Saint Benedict. Benedictines live a life with a quality being subtle. O God, who inspire and bring to fulfillment every good intention, direct your servants into the way of eternal salvation, and as they have left all things to devote themselves entirely to you, grant that, following Christ and renouncing the things of this world, they may faithfully serve you in their neighbor in a spirit of poverty and humility of heart. I’ve blogged about Monastery of Saint Peter and Paul (Monastero Ss. Pietro e Paolo), Cascinazza (Milan), before here. My friend Father Cyril Crawford died unexpectedly a short time ago, on 15 May 2012. He died in his sleep in Leuven (Louvain), Belgium, at the Katholieke Universiteit Leuven, where he was working on a doctorate in Philosophy so that he could teach at his monastery’s college. 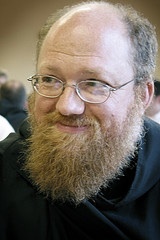 Dom Cyril, 46, was a monk and a priest of the Abbey of Saint Joseph of Covington, LA. A photo tribute to Cyril can be seen here. Over at The Substance of Things Hoped For, Benedictine Father Denis Robinson (Rector of Saint Meinrad Seminary) wrote a remembrance of Dom Cyril. Father Denis’ words are very true and capture Cyril well. I met Cyril at Saint Meinrad’s, in the library, and found him to be a friend. My heart is saddened, deeply so. Cyril as a good monk, priest with an honest search for God and keen sense of humor and intellect. More info including Abbot Justin Brown’s homily at the Mass of Christian Burial of Cyril can be found here. Saint Benedict and Saint Cyril of Alexandria, pray for Father Cyril, and for us.